The pomegranate tree has been around since biblical times and is said to be one of the oldest fruits known to man. People of ancient generations cultivated this fruit punica granatum pomegranate and enjoyed it fresh from the tree or bush. Today, you can do the same! This tree typically has 3-5 trunks if it is one of the modern varieties and is healthy. Pomegranate fruit trees are deciduous, love the summer heat, and can withstand very dry weather. It’s a hardy breed of fruit tree that can also survive winter temperatures as low as 10 degrees Fahrenheit. Even though the tree can manage well with very little water, it’s best to plan an irrigation schedule so you can harvest the most flavorful and delicious fruit possible each year. What is Your Pomegranate Tree Story? Mature trees can reach up to 12 feet in height, making them an ideal candidate for training up a trellis or pole if you like. Once the fruit arrives, you’ll see bunches of 3-4 fruits nestled between beautifully shaped oval leaves. These trees are easy to grow and treat you to beautiful blooms in addition to tasty fruit. Ah, the flavor of the pomegranate is one that you wont’ soon forget. Depending on the type of pomegranate tree you’re growing, the fruit flavor can be on the sweet side or on the very tart side. The pomegranate resembles an apple at first glance, but once you take a closer look, you’ll notice that it has a crown rather than a stem. Some of the more established varieties of pomegranates grow with thorns on the branches, but if you’re trying out one of the more recent hybrids of pomegranate bush or tree, the branches will grow without thorns. Many people grow pomegranates in their backyard just for food, but the fruit itself can be ornamental too. Pomegranates are primarily known for their beautiful bold red color, but there are varieties that produce fruit that is green, white, and purple too. The seeds, or arils, inside the fruit can be red, pink, or even pure white. Growing pomegranates isn’t difficult if you live in the right climate zone. Found primarily thriving in Mediterranean countries, which is where pomegranate origin is credited, the pomegranate bush or tree can also be cultivated and grown in the United States if you live in zones 7 to 10. Essentially, that is the southern part of the U.S. These trees also thrive in the southern areas of Europe that are dry and humid. Pomegranate plants are an excellent choice for backyard gardeners who like to try out their green thumb on something new and different. This fruit tree is strong and tenacious, making it a great choice for brand new gardeners and experienced gardeners alike. How Do I Grow a Pomegranate Tree? It’s usually best to purchase plants from a nursery that has already been established from seed (unless you’re experienced with growing fruit trees from seed). Typically these trees are sold in five-gallon containers, so they’re easy enough to transport home. If you're up to it you can grow your own pomegranate. You’ll only need one tree to produce fruit because these fruit trees are self-fruitful. 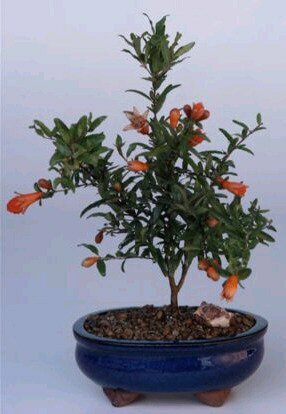 Pomegranate propagation can be done from seedlings, or hardwood cutting, they both can produce delicious fruit. Plant the tree in full sun and establish either a watering schedule or an irrigation system that will water the tree regularly (but not too much). Pomegranate pest and disease problems can arise, so take the time to learn about how to prevent disease and how to repel pests from damaging your tree. 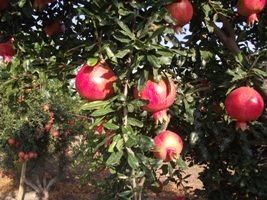 Pruning pomegranate trees is also an important step to keep the plant healthy and viable. By proper caring for fruit trees, you can expect to enjoy juicy pomegranate fruit beginning in the early fall. A few varieties will ripen slightly prior to the fall months, but typically this is when the fruit comes in and tastes the most delicious. The leaves of the tree will turn yellow and fall off, but will return in full force in the spring. 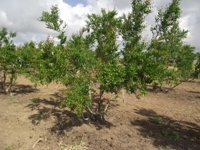 If you’re interested in pomegranate trees for sales purposes, it’s wise to visit a farm or nursery that cultivates and grows these trees in order to get an idea of how it’s done. The most popular varieties are the ones listed above, but some people do very well creating their own hybrid of pomegranate fruit or by obtaining varieties that are more difficult to find in an effort to offer them in more areas of the country. Why Grow This Amazing Fruit? You’re going to love walking out to your back yard and picking fresh fruit! It’s a fruit that may have ancient roots, but the health benefits the pomegranate offers are timeless. Packed with antioxidants and other fantastic nutrients, vitamins, and beneficial fibers for your daily regimen, this fruit will help your body to fight disease and perhaps even remedy medical conditions from which you are already suffering. It’s an easy tree to grow, and you only need one, so why not give it a try this year? These trees come back year after year, so you’ll have the chance to make delicious recipes, jams, jellies, and even wine if you so desire. It’s really a win-win endeavor. Check out the page that talks all about the history of the pomegranate! We think you’ll find it extremely fascinating. Imagine biting into a fruit that was also eaten by people in ancient days! Pretty amazing, isn’t it? 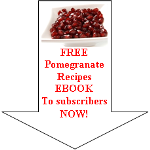 Read enough about pomegranate tree and want to discover more about the amazing pomegranate health benefits? is a one stop site for organic gardening tips and advice. Visit the forum, browse the free classifieds of find a professional in the business section. Link Juice - Get Linked! I promise to use it only to send you Hot Pomegranate News.